2019 ( GB ) · English · Criminal, Drama · PG-13 · 113 minutes of full movie HD video (uncut). You can watch The Informer, full movie on FULLTV - An ex-convict working undercover intentionally gets himself incarcerated again in order to infiltrate the mob at a maximum security prison. 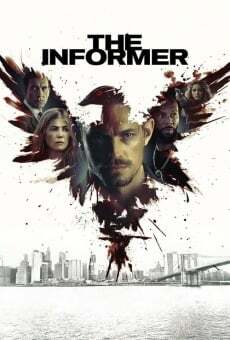 You are able to watch The Informer online, download or rent it as well on video-on-demand services (Netflix Movie List, HBO Now Stream, Amazon Prime), pay-TV or movie theaters with original audio in English. This film has been premiered in theaters in 2019 (Movies 2019). The official release in theaters may differ from the year of production. Film directed by Andrea Di Stefano. Produced by Wayne Marc Godfrey, James Harris, Anders Erdén, Jonathan Fuhrman, Babak Eftekhari, Nicholas Goldfarb, Lee Broda, Shelley Browning, David Dinerstein and Alastair Burlingham. Screenplay written by Andrea Di Stefano, Rowan Joffe, Anders Roslund, Matt Cook and Börge Hellström. Soundtrack composed by Will Blair and Brooke Blair. Film produced and / or financed by Thunder Road Pictures and The Fyzz. As usual, the director filmed the scenes of this film in HD video (High Definition or 4K) with Dolby Digital audio. Without commercial breaks, the full movie The Informer has a duration of 113 minutes. Possibly, its official trailer stream is on the Internet. You can watch this full movie free with English subtitles on movie TV channels, renting the DVD or with VoD services (Video On Demand player, Hulu) and PPV (Pay Per View, Movie List on Netflix, Amazon Video). Full Movies / Online Movies / The Informer - To enjoy online movies you need a TV with Internet or LED / LCD TVs with DVD or BluRay Player. The full movies are not available for free streaming.